No doubt that he is one of the best players in the Indian Cricket team today. He has been instrumental in many wins in the recent times. I like to watch him batting, but still there is something I don't like in this guy. 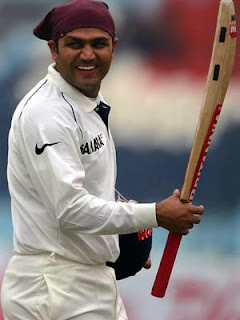 Every time when he is shown in close-ups, while fielding, Sehwag very frequently keeps spitting on the play ground. I wonder if he will does the same thing, inside his home. Unfortunately spitting in public places is not an offcence in India, and thats the reason we see many idiots doing that inside the buses, inside the trains, inside the cinema halls, on the roads and everywhere. Oh God, please make this guys realize their mistakes. Normal food became Fast Food! 5 days long cricket matches changed to ODIs and then to T20s!!! Almost everything have changed (in fact shortened) for the comfort of people. 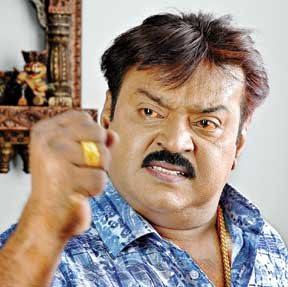 In this line, the next big change that I want is shortened tamil movies. In the recent times, almost all the movies that I watched, was worth to watch only for 1 to 1 1/2 hours. There was stuff only for that duration. For the remaining parts, the directors really didn't know what to show and it was absolute mokkai. It will really be good to the audience if these people break the normal 2 1/2 hours rule and make some real good movies with the little good things they have. Lets hope for the change..